Visit here if you would like to help walk the greys. Welcome to Makants Greyhound Rescue. If this is your first visit please read our Privacy Notices Don't forget to Like us on Facebook! We have started to receive a large amount of homing applications for greyhounds who are ‘cat friendly'. In order not to waste applicants time we need to point out that ‘cat friendly’ greyhounds very rarely come into our care. The majority of our greyhounds have come straight from the racing industry and we have no way of knowing how they would react around cats, neither do we have the facilities for testing their suitability with them. e haWe have started to receive a large amount of homing applications for greyhounds who are ‘cat friendly’. In order not to waste applicants time we need to point out that ‘cat friendly’ greyhounds very rarely come into our care. The majority of our greyhounds have come straight from the racing industry and we have no way of knowing how they would react around cats, neither do we have the facilities for testing their suitability with cats. We have, therefore, decided that future homing posts for our hounds will state that our greyhounds are NOT cat friendly. On the rare occasions we have a cat friendly hound in kennels we will advertise it as such.ve started to receive a large amount of homing applications for greyhounds who are ‘cat friendly’. We have, therefore, decided that future homing posts for our hounds will state that our greyhounds are NOT cat friendly. On the rare occasions we have a cat friendly hound in kennels we will advertise it as such. We start the week with news of a homing and this time it's shy girl MYLENE. Sweet girl Sophie arrived with us last month and has wasted no time charming everyone she meets - she has definitely become a favourite among our walking volunteers. Sophie walks well on the lead and doesn’t react negatively to any dogs she meets on her walks. She has spent time overnight in one of our volunteer’s homes and has behaved well - in fact Siobhan describes her as ‘adorable’ and can’t understand why she hasn’t been snapped up yet. which can be found under the ‘adopt/foster’ tab and one of our team will get back to you. Many thanks to Penni and Danny for sharing their ‘adoption and after’ story with us. “ …We had wanted to adopt a greyhound for a long time and have been involved with Makants since 2014. It seemed ideal when we moved into our own accommodation and we approached Makants asking Siobhan to give us a chance. Initially she was unsure which dog to pair us with, but suggested we could try Harry, a large black male with a toy obsession. When we met Harry he was withdrawn and disinterested (not quite the welcome we expected!) but we decided to give it a go and brought him home with us. Immediately he became comfortable in the house and fell into home life, he claimed the couch, the bed, the rug and basically anything soft! Danny and I were besotted, we became utterly obsessed by him and would fuss him at every opportunity, we renamed him Dexter and he slotted into our little family perfectly. After things had settled with Dexter we spent time mithering Siobhan to allow us to adopt another hound. One day in November, Danny's sister visited Makants and fell in love with a little black female called Dotty. Then a message came from Siobhan 'would you like to try Dotty with Dexter?'. We couldn't believe our luck and off to Makants we went to pick up the fourth member of our family. When we met Dotty it was love at first sight, she is an absolute cuddle monster and wants to be centre of attention at all times! From the start she had a lot of opposite traits to Dexter and I think that's why it worked so well, I guess opposites really do attract! They are best friends, like chalk and cheese but wouldn't ever be without each other, they complement each other perfectly. Now we've experienced life with a greyhound (or two) we don't feel like anything else could compare. We’ve never known a breed of dog to have such character, they have all these crazy little quirks (teeth chattering, roaching, pogoing) to name a few. They're hilariously funny and so ready to be loved. They also have this strange sixth sense where they are totally in tune with our own emotions and seem to know when you need cheering up. They have been on two holidays, accumulated over ten different coats (and bandanas and collars and pyjamas), Dexter even met Father Christmas at our local Xmas fair. Dexter and Dotty now even have their own Instagram following with over 4,000 followers! To sum up, adopting Dexter and Dotty is the best thing we ever did, we really can't thank Makants enough and urge everyone to do the same! Makants walking volunteer Chris adopted Sally from us last year and this is what Chris has to say about this stunning girl. “I was volunteering as a walker at the farm on the day when Sally arrived in a pretty sorry state. Her fur was well out of condition, she was very stressed and had a nasty stomach upset. Despite all this I knew straight away that I had to adopt her and the rest, as they say, is history! I’m pleased to say that Sally has gone from strength to strength since the day she arrived in Makants care. She is now supremely confident, greeting everyone – human or canine - as if they were her long lost friend! I take her to a local country park and am able to let her off the lead. Sally loves l to play with all the dogs there, including splashing about in the river, fetching balls (something greyhounds aren’t usually well known for) and generally having a great time. She now has a huge fan club as all the other dog walkers know her and love her to pieces. A very proud day for us both was in August last summer at the Hillcrest dog show in Chorley where Sally was awarded two rosettes , one of which was for Best Rescue. It was a very emotional moment and showed what a long way she had come from that day only months earlier when she had arrived at Makants kennels. Many thanks to Maria and Pete for this account of their adoption of three (yes three!) greyhounds from Makants. "Before we adopted our first hound we'd had two lurchers. They were brother and sister litter mates Leo and Sweetpea and were wonderful pets. When sadly Leo died at the age of 12 we decided to get a companion for Sweetpea and were on the lookout for a calmer, older dog. We were pointed in the direction of Makants and Domingo was suggested, being a very laid back and gentle hound. These two got on well but sadly their time together was cut short when Sweetpea died a couple of months later. Domingo hated being on his own and displayed unsettling behaviour (chewing the windowsill! ).We were soon back in touch with Makants and Siobhan suggested Blue, or Bluebell as she is now called. At the beginning Bluebell was not easy on the lead and was on her guard constantly fearing sudden movements. As time went on, and with the help of Domingo, she settled in with our family and learnt that we just wanted to love her. She was very attached to Domingo and would cuddle up close with him on the sofa. Bluebell is a more active dog than Domingo and likes to play but Domingo prefers to chill out. When I became a self employed dog walker we started to think about adding a third dog to our family and that was when Toby came into our life. He was 6 months old and had been born at Leigh Cats and Dogs home but had been adopted then left to live in a garage. He then spent time with a Makants foster family, their greyhound and cat too. We finally adopted him when he was 7 months old. To say he was a challenge at first is an understatement! He chewed our furniture, barked all the time, pulled on the lead and was a real little land shark! However, he is now the most loving and adorable chap, he still has his mischievous moments but we wouldn't have him any other way. My dog walking business has now expanded to include home boarding. We've had all sorts of breeds stay with us from Bernese Mountain dogs to tiny dachshunds and our dogs always make us proud by the way they make our boarders feel at home and Toby in particular loves having lots of different playmates. I'd advise that anyone looking to adopt a dog considers a greyhound (or 2 or 3) as they do make the most fantastic pets". Relating to the taking of photographs and/or film footage at events. 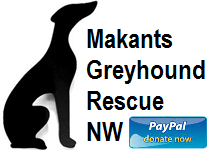 Makants Greyhound Rescue NW gathers photos and/or film footage at all events that it attends. Images may be used in press releases, printed publicity and published on Makants Greyhound Rescue NW’s facebook page and website. Any images used will be stored securely and all unused images will be deleted. Any image will not be kept for longer than they are needed for the purposes listed above. If at any time you prefer for you and/or your family member not to be photographed or visually recorded, or you would like to see your images, or would like us to delete them, then please email the charity on [email protected] or call 07960561988 at any time.